F. Perkins Limited was, established on 7 June 1932 at Queen Street, Peterborough,England.The company was set up to design and manufacture high-speed diesel engines. The founder Mr Frank Perkins gave a 10% share to Mr Charles Wallace (1897–1979) who was a exceptional design engineer, he initially became company Secretary then technical director. He was to remain with the business for more than a decade, before re-joining the RNVR – though remaining a consultant to the company. Frank Perkins obtained further initial support from directors Alan J M Richardson and George Dodds Perks. Before Chapman and Perkins the diesel engine was a heavy and slow revving workhorse, lacking performance. Chapman’s concept was the high-speed diesel – an engine that could challenge gasoline as the primary motive power. 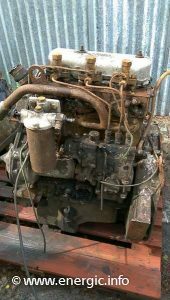 The world’s first high-speed diesel engine was claimed to be a Perkins’ four-cylinder Vixen, which made its debut in 1932. In October 1935 Perkins became the first company to hold six world diesel speed records for a variety of distances set at the old Brooklands track in Surrey. Sales were strong and by 1939 the company made two series of engines, P4 and P6. After the war, the company went public and established a number of licensees for local manufacturing and sale of its by then established diesel engines. In 1959 F. Perkins Ltd was purchased by its largest customer Massey Ferguson tractors. It kept its name of Perkins Engines and ran a s a separate company. Perkins engines Ltd bought Rolls Royce engines, Shrewsbury in 1984, (Perkins continued to supply British Rail with engines for its train units. In 1986 they purchased Gardner engines to complement their line of lighter diesel engines. In 1994 it was acquired and became a subsidiary of Lucas Varity. Development continued and Perkins updated its engines to meet stricter emissions rules while developing new series for power generation and forklift trucks. Perkins engines where a large supplier to Caterpillar from the 1970’s and was eventually bought by them in 1998 for US$1.325 billion, creating what they claimed was the world’s largest diesel engine manufacturer. Perkins Engines Company Limited is now a primarily diesel engine manufacturer for various diverse global markets including Agriculture, marine, construction, power generation, Material Handling, industrial and power generation. With factories and manufacturing facilities in the United Kingdom, United States, Brazil, China, India and a joint venture with Ishikawajima-Shibaura-Machinery company in Japan. It is a world leader in engines manufacture. Perkins engines where used in the Energic 545 range of tractors of the 1970/71. 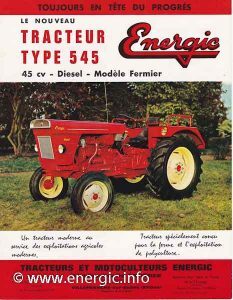 Energic perkins engine/moteur tracteur 545. 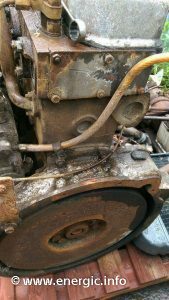 See more about Perkins engines used in Energic Tracteur 545 here.